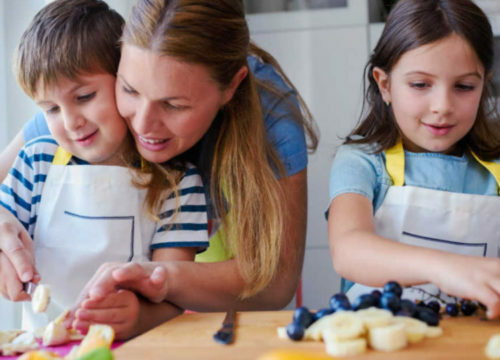 SuperKids Nutrition caught up with nutrition expert and author Elizabeth Ward, MS, RD about how she gets her kids excited about cooking and the importance of making healthy eating a family affair. Elizabeth is a former spokesperson for the American Dietetic Association and has authored more than five nutrition books including, MyPlate for Moms, How to Feed Yourself & Your Family Better: Decoding the Dietary Guidelines for Your Real Life, The Complete Idiot’s Guide to Feeding Your Baby and Toddler and Expect The Best: Your Complete Guide to Healthy Eating Before, During, and After Pregnancy. Keep reading to find out how she gets her kids to eat more vegetables and her tips on how to fit cooking into a busy schedule. What do you think are the top 3 important things to think about when feeding your kids? I think the most important things are to get kids involved in the process of feeding themselves, to ask them about their food preferences, but to not let them make all the decisions, and to educate them, patiently, about what they need to grow and to stay healthy. How do you get your kids excited about cooking? My kids love to cook, so I am lucky. Whenever they see a recipe they would like to try, they save it. We keep a big notebook of recipes that we’ve tried and ones that we plan on trying in the future. This “big book of recipes” gave me the idea for the blog I write for USA Today about cooking with my kids. The blog is about a particular recipe, the substitutions we made, how it tasted, (I only publish recipes we like and think others would like, too) and sometimes about the skills the kids have learned, like butterflying a pork tenderloin! Trying out a recipe involves making a grocery list, shopping, cooking, and cleaning up – in other words, it includes organization and planning. My mother taught me how to cook to nourish my body, and now I am teaching my three girls. 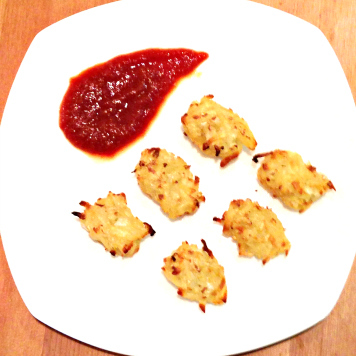 Here are some easy healthy recipes to make with your little chef! 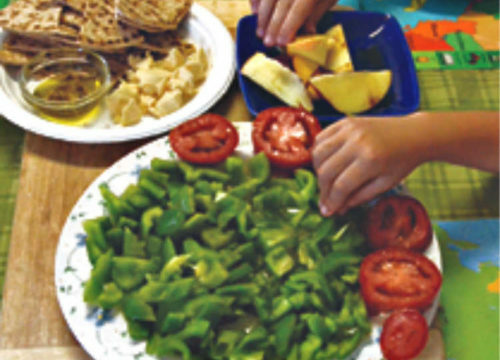 What is your favorite meal to prepare with your kids? We all love to make wonton soup. We make it on weekends because it takes a bit of time to make the filling, fill the wontons and cook them. It’s messy and a whole lot of fun! My kids love breakfast for dinner, and that’s something they can make on their own, so it works for weeknights. We’ll have omelets or French toast made with whole grain bread, and 100% orange juice. Eggs are easy to work with for quick simple meals, and I always use Eggland’s Best because they have twice the DHA and vitamin D of regular eggs and 10 times the vitamin E.
What are 3 steps you’ve found to be effective in getting your family to eat more vegetables? I am so glad that you asked, because I struggle with getting my kids to eat vegetables, just like most moms. Here’s my solution: fat! 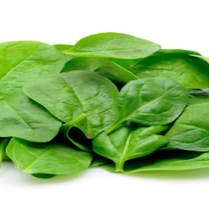 Fat adds flavor and makes vegetables more enticing. Our new favorite way to eat cabbage is a Ramen Noodle Salad with…you guessed it, Ramen Noodles! It has sliced almonds, mandarin oranges, and a dressing made with canola oil. I also roast vegetables to bring out their natural flavors. We eat a lot of roasted broccoli and cauliflower. I serve raw vegetables with hummus or low-fat Ranch dressing, steamed with a bit of margarine on top, or in the pureed form! I try not to disguise vegetables, though I will sometimes add a can of pureed pumpkin to homemade chicken soup without telling them. Well, I would have to say our nod to health is eating dark chocolate instead of milk chocolate! That’s about as far as it goes. We eat really well most of the time, so when we eat treats, they’re not all that healthy! Yes, planning, planning and more planning! On weekends, take some time to think about the coming week, plan your dinners, consider what you need on hand for healthy breakfasts, lunches, and snacks, and then shop for ingredients. Here are some priceless tips for making grocery shopping easy. On Saturday or Sunday, try to make at least one healthy dish to have during the weekend. My favorite is chili with 95% lean ground sirloin, served with a green salad, fruit, milk, and crusty whole grain bread. Beef stew, chicken soup, and lasagna are great to have on hand, too. Don’t worry about making anything too elaborate during the week when you may be pressed for time. Pizza prepared with whole-wheat pita bread or naan, vegetables (frozen are fine), fruit and milk is a fine meal. So is roasted chicken, rice or mashed potatoes, fruit, and milk. When is the best time to instill good eating habits in your children? When you’re pregnant! The womb is your child’s first environment. Eating a healthy, varied diet when you’re pregnant and nursing exposes your child to an array of nutrients. Here are some quick & nutrient-dense meals to enjoy while pregnant. Once you’ve delivered, breastfeeding is preferred over formula feeding; babies are more apt to stop eating when they are full as they are born with an innate ability to regulate their food intake. Parents often try to override a child’s natural ability to stop eating when they are full because they fear their child isn’t eating enough. Look out for your baby or toddler’s hunger cues to tell you when he’s feeling satiated. When you start solid foods, don’t expect your child to eat much, as he is getting accustomed to using a spoon as well as to the texture of food. 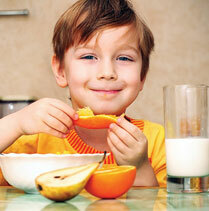 As time goes on, offer your child nutritious foods and be sure to eat those same foods with him. There is nothing more powerful than a good example! Do not keep soda or juice drinks in the house because they are too tempting for a child; he’ll see you drinking them and want some. Serve only milk (whole milk until two years old) and 100% juice in the house (limit juice to 6 ounces a day until 6 years of age, and don’t give juice until at least 6 months of age). You are a busy mom of three, how do you make fitness a priority for your health? My fitness is a top priority because I need to stay healthy to care for my children. I am lucky because I can get up very early to exercise, and because as a registered dietitian, I know what to eat (not that I always follow my own advice!) A lot of moms put their health and wellness last. This is a big mistake. I am not saying to take care of yourself at all costs, but I do think that eating well and getting regular physical activity makes you a better parent and gives you the energy to manage the household, work outside the house, or both. Decide what is best for you in terms of exercise and eating and stick to it. That said, your routine will change as your children grow, so roll with the punches. But never ever put your health on the back burner. You will suffer for it, and so will your family. Here are some tips for fitting exercise into your family’s busy schedule. It’s pretty simple, actually. It takes a lot of effort to raise healthy eaters, but it’s worth the work. There is no greater gift than teaching your child what he should eat for good health because what you say, as well as the example you set as a positive role model, will stay with him for a lifetime. Elizabeth M. Ward, MS, RD, is a freelance writer and nutrition consultant. She is the author of MyPlate for Moms, How to Feed Yourself & Your Family Better: Decoding the Dietary Guidelines for Your Real Life, Expect The Best: Your Complete Guide to Healthy Eating Before, During, and After Pregnancy; The Pocket Idiot’s Guide to the New Food Pyramids; The Complete Idiot’s Guide to Feeding Your Baby and Toddler; Healthy Foods, Healthy Kids: A Complete Guide to Nutrition for Children from Birth to Six Years Old, and Pregnancy Nutrition: Good Health for You and Your Baby. Ward is also the co-author of Super Nutrition After 50 and contributing editor for Pillsbury’s Healthy Baking. She writes on a regular basis for Men’s Fitness, WebMD, and USAToday.com. As a spokeswoman for the American Dietetic Association from 1992 to 2002, Ward was featured in nearly 1,000 print and broadcast interviews, including CNN, U.S. News & World Report, The New York Times, and The Boston Globe. She has appeared on NBC’s Today Show. Ward has been a speaker at hundreds of professional meetings, including The American Dietetic Association, The Massachusetts Dietetic Association, The Florida Dietetic Association, The National Association of Catering Executives, The Pennsylvania School Food Service Association, and the International Congress of Dietetics in Paris. Ward completed her undergraduate degree in human nutrition at the University of Massachusetts, Amherst; a one-year dietetic internship at Brigham and Women’s Hospital in Boston, and a master’s degree in mass communication at Boston University. She is the recipient of the 125 Alumni to Watch Award from the University of Massachusetts, and was named Recognized Young Dietitian of the Year by the Massachusetts Dietetic Association.